If you’ve ever considered offering your talents as a private voice teacher, only to dismiss the idea in favor of something a bit more “reliable,” don’t worry – we’ve been right there with you. Sure, you are a good singer, you like to teach, and you’re genuinely interested in helping people on their road to success. But can you really make any money doing this sort of thing? This is basically starting your own business, isn’t it?! You’re right- it is, and yes, you really can make money doing this sort of thing. You really can find clients, set your own hours, and be your own boss! 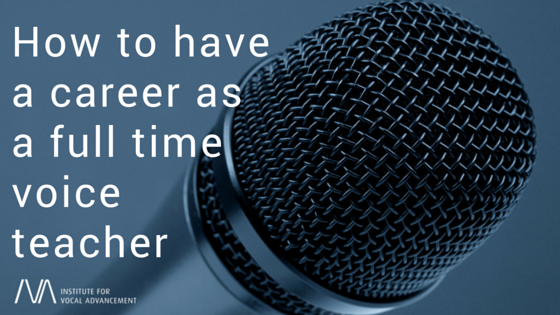 The world is in need of more passionate, dedicated teachers of singing. How lucky are you that it’s possible to create a legitimate career out of it! If you’re brand new to teaching, seek education and experience – that may mean giving some free lessons (or close to free) as you start out in order to get yourself going. The more voices you are able to work with, the more chances you have to accrue “on-the-job” experience learning HOW to help different students and address their needs. One of the first things I realized as I started to teach was that as I became a better teacher, my lessons were of higher quality, which meant I could increase my rates accordingly. I started teaching as a young adult and charged a very nominal fee. I went to college for a degree in Music Education and found that during that time, people were willing to pay more for lessons. After I finished my degree and started working full time, people assumed that I had great knowledge and were willing to pay an even higher rate. Still, even with my degree, I sometimes felt like a fraud because I didn’t know all of the answers. When I started studying with the Institute of Vocal Advancement (IVA), I actually began to understand how the voice worked and how to help my students individually. Joining IVA was a huge turning point in my education. It’s an investment that pays off daily. I believe wholeheartedly in the following equation. Time + Education + Dedication = Success. As I’ve gained a college degree and now am continuing my education with IVA, my teaching is monumentally more effective than when I began. My students feel it, I feel it, and my career as a teacher has boomed as I’ve been able to increase my rates and create a career because of it. I am blessed to be teaching voice and making money doing so. There is nothing better than doing what you love and getting paid to do it! I had just graduated college, and it was time for me to decide… What the heck was I going to do with my life? I knew I wanted to teach voice, and it had always been in the back of my mind as something I would love to do, but let’s face it, it’s not a “real person job,”right? WRONG!!! When faced with either looking for a desk job or starting my teaching career, I decided that if I were to do this, I’d jump in with both feet and just see what happens. Yes, it was a bit of an investment at first, but because I was willing to invest in my voice teaching education with IVA, I became a better teacher. Because I became a better teacher, I attracted more students. Because I attracted more students, I made more money. The more I learned about the voice and about teaching, the better I felt about increasing my teaching rate . Before long, I was choosing my own hours, I could teach fewer lessons to cover my costs, and I was bringing in more income- more than any “real person” office job I was applying for, that’s for sure! Because of that decision, I supported both myself and my husband through school, and have saved tens of thousands of dollars for our future. I now have a full-blown business and YES- this is my full time job. On top of that, I am doing something that I love. I teach voice because helping singers to develop and understand their OWN voice has proved to be more fulfilling than any other job I’ve ever had. And thanks to IVA, I know that I am offering the very best. A friend of mine, Matt Ramsey, is a teacher in Austin, TX. A busy musician and singer himself, Matt had no plans to be a singing teacher. But at the recommendation of his own voice teacher, he gave it a shot. What would you need to make each month in order to quit your day job and establish your career as a voice instructor? How many hours does that translate to each week? It’s probably not as much as you think. For instance, after gaining some teaching experience, say you decided “Let’s do this! I want to be a voice instructor full time,” and you charged $25 for a half hour lesson ($50/hour). You want to become a knowledgeable, effective teacher who can efficiently help clients, so you join IVA and invest in yourself and your career. 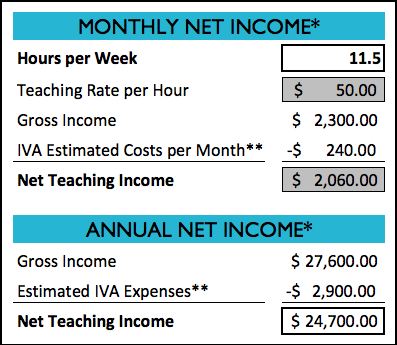 In order to meet your monthly living costs of, say, $2060, you discover that you only need to teach 11.5 hours per week! That’s only 12 students taking an hour lesson each week or 23 students taking a half hour lesson each week. If you taught for four hours, three days per week, you would be able to support yourself and be your own boss! But “how do I get those students?” you may wonder to yourself. Assuming you quit your day job, you now have 28.5 surplus hours in your week to market yourself, network, and reach out to interested clients. * Monthly income calculation is based on a four-week month. Annual income calculation is based on 48 working weeks. You might as well have some good vacation time if you’re arranging your own schedule! ** IVA Education expenses are calculated using a higher estimate of annual basic education requirements. Just to reinforce what we discovered in the scenario above, let’s take a moment and compare the pay rates and working hours of your current job versus the teaching hours required to accrue the same amount of money. As shown in the table above, if your salary was $3000 per month working 40 hours per week, you could teach for a third of those hours and earn the equivalent income. Or if you didn’t have a salary job, but were being paid an hourly rate of $12.50, you would have to work four times the hours in order to make the same amount. As a singing instructor, think about how your quality of life could change: you’d gain the flexibility of designing your working schedule (in fact, fewer hours if you wanted), you’d be doing something you love, and you’d make meaningful connections with clients who grow from the guidance you give them. Know that you don’t have to embark on this alone. The Institute for Vocal Advancement helps hundreds of teachers around the globe get the vocal education and business smarts to make this career a reality. Even more than that, it’s a network of brilliant teachers and mentors who will support you in your personal career development. What’s true of our voices is also true of our teaching, we need great teachers to guide us. So don’t wait! Crunch your own numbers and see how many hours of teaching it would take to make this dream a reality. Get the education you need to offer the very best lessons to your clients. And, when you’re ready to take the leap, all of us here at IVA will be thrilled to welcome you into our community.